Army officials have begun the years-long process of decommissioning Alaska’s first and only nuclear power plant, located at Fort Greely. The facility was built during the height of the Cold War, then shut down in 1972 after 10 years of on-and-off operation. Much of it was dismantled and disposed, the rest encased in concrete. And now, the Army Corps of Engineers plans to remove most or perhaps all of what’s left of the plant. 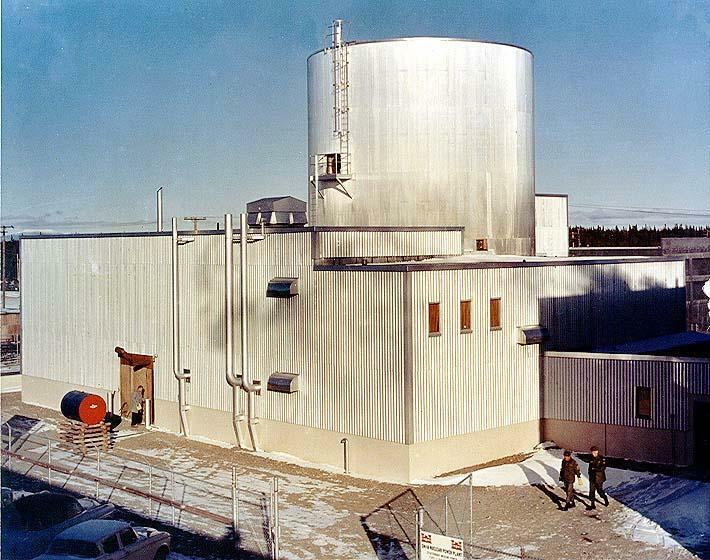 The Army built Fort Greely’s nuclear power plant, called the SM-1A, as part of an experimental program to determine if such facilities could be built and operated in remote sites more cheaply than diesel-fueled powerplants. “The main approach was to reduce significant fuel-transportation costs by having a nuclear reactor that could operate for long terms with just one nuclear core,” Brian Hearty said. Hearty manages the Army Corps of Engineers’ Deactivated Nuclear Power Plant Program. Hearty says the Army built the SM-1A in 1962 in hopes the facility could provide power reliably at remote radar sites around the Arctic that would scan the skies for incoming missiles from the Soviet Union – which at that time, was America’s archrival. “Because of the Cold War, the Air Force and Army were looking at the potential for a lot of the defense radar sites to be located up there,” Hearty said in a telephone interview last week. Hearty says the program worked. But maybe not in the way Pentagon officials had hoped. They learned the SM-1A could be built and operated in a cold and remote locale. And they discovered its upfront costs were much higher than anticipated, and that it costs more to maintain than a diesel power plant. But, he says, the program soon was no longer relevant, because of the Soviets’ advances in rocket science. “One of the big things that shut down the program overall was the creation of the ICBMs that go up over the defense early-warning systems,” Hearty said. So the SM-1A, built at a cost of about $17 million dollars, was shut down in 1972 after eight years of operation – it was out of commission from 1967 to 1969 for extensive repairs. Hearty says the plant was partially dismantled soon after it was deactivated. The power plant produced 1.8 megawatts of electricity and 20 megawatts of thermal energy, including steam, which was used to heat the post. That part of the system was still needed, so Army officials removed most of the nuclear-power system and hooked the heat and steam components to a diesel-fired boiler. But they left several parts of the nuclear system in place, including the highly radioactive reactor pressure vessel and reactor coolant pumps. That is what remains to be cleaned up, along with other remediation, in order for the SM-1A to be declared fully decommissioned. Hearty says the Corps of Engineers wants to remove all of the stuff, but he says it’s not yet known whether that’s feasible. Meanwhile, he says monitoring for radioactivity around the facility shows it remains at acceptably low levels. “It would be safe to say there’s no threat to human health in the environment,” Brenda Barber project manager for the decommissioning, says. Barber says it’s still in its early stages, and won’t be completed until 2026 at the earliest. Barber says the Corps awarded $4.6 million contract in December to a Virginia-based firm to develop a long-range plan for the project. Among other things, that’ll help agency officials determine how much of the SM-1A will remain after it’s decommissioned. Barber says she and other officials working on the project visited the site in January. She says she and Hearty will be back in April to again meet with post officials, as well as members of a local community advisory board. And she says that’s when planning will begin in earnest for the final disposition of Alaska’s one and only nuclear power plant.